Calcite, which gets its name from "chalix" the Greek word for lime, is a most amazing and yet, most common mineral. It is one of the most common minerals on the face of the Earth, comprising about 4% by weight of the Earth's crust and is formed in many different geological environments. Calcite can form rocks of considerable mass and constitutes a significant part of all three major rock classification types. It forms oolitic, fossiliferous and massive limestones in sedimentary environments and even serves as the cements for many sandstones and shales. Limestone becomes marble from the heat and pressure of metamorphic events. Calcite is even a major component in the igneous rock called carbonatite and forms the major portion of many hydrothermal veins. Some of these rock types are composed of better than 99% calcite. Why would a collector be interested in such a common mineral? Because of its extraordinary diversity and beauty! With calcite so abundant and so widely distributed it is no wonder that it can be so varied. The crystals of calcite can form literally a thousand different shapes by combining the basic forms of the positive rhombohedron, negative rhombohedron, steeply, moderately and slightly inclined rhombohedrons, various scalahedrons, prism and pinacoid to name a few of the more common forms. There are more than 300 crystal forms identified in calcite and these forms can combine to produce the thousand different crystal variations. 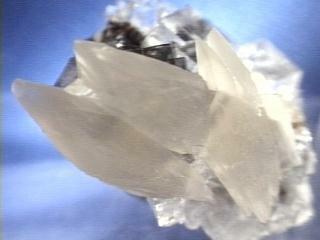 Calcite also produces many twin varieties that are favorites among twin collectors. There are also phantoms, included crystals, color varieties, pseudomorphs and unique associations. There simply is no end to the varieties of calcite. There are several varieties of calcite and it would be impossible to describe them all. However there are a few standouts. Possibly the most well known of calcite's varieties is its most common form, the classic scalenohedron or "Dogtooth Spar" as it is sometimes called. This variety appears as a double pyramid or dipyramid, but is actually a distinctly different form. The point of the scalenohedron is sharp and resembles the canine tooth of a dog, hence the name. Beautiful clear colorless or amber-orange examples of this variety are considered classics and outstanding examples come from Pugh Quarry, Ohio; Cornwall, England and Elmwood, Tennessee but the variety is found worldwide. Not necessarily a variety of calcite, cave formations are certainly a unique aspect of calcite's story. 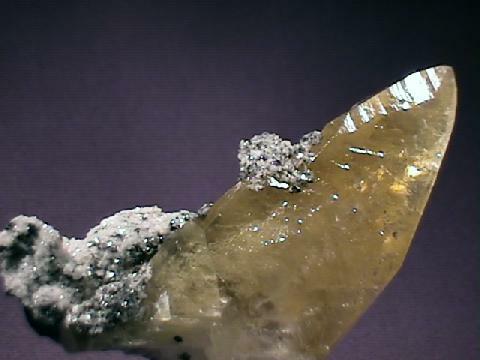 Calcite is the primary mineral component in cave formations. Stalactites and stalagmites, cave veils, cave pearls, "soda straws" and the many other different cave formations that millions of visitors to underground caverns enjoy are made of calcite. It is the fact that calcite is readily dissolved that these formations occur. Overlying limestones or marbles are dissolved away by years and years of slightly acidic ground water to percolate into the caverns below. In fact the caverns themselves may have been the result of water dissolving away the calcite rich rock. As the calcite enriched water enters a relatively dry cavern, the water starts to evaporate and thus precipitate the calcite. The resulting accumulations of calcite are generally extremely pure and are colored if at all, by very small amounts of iron or other impurities. Mexican onyx is a variety of calcite that is used extensively for ornamental purposes. It is carved into figurines and is so popular that almost every child in the USA owns a small onyx animal or two. Carvings such as vases, bookends, plates, eggs, obilisks, pyramids and statues are all popular. It is not the same onyx as the quartz variety of onyx which is a little more precious (it is used in jewelry) and is banded white and black. To avoid confusion it is best to refer to it as Mexican Onyx. Mexican onyx is banded with multiple orange, yellow, red, tan, brown and white colors that have marble-like texture. The carvings are quite attractive and affordable; a rare combination! Another variety is the so called "Iceland Spar", which is basically clear cleaved fragments of completely colorless (ice-like) calcite. Originally discovered and named after Eskifjord, Iceland where the calcite is found in basalt cavities. In rock shops around the world, iceland spar is available in large quantities and at affordable prices and are popular among children. Most of today's iceland spar comes from Mexico. The iceland spar displays the classic cleavage form of calcite, the rhombohedron. Iceland spar was and is used for optical equipment and during World War II it was a strategic mineral as it was used for the sighting equipment of bombardiers and gunners. It is iceland spar that best demonstrates the unique property of calcite called double refraction. Double refraction occurs when a ray of light enters the crystal and due to calcite's unique optical properties, the ray is split into fast and slow beams. As these two beams exit the crystal they are bent into two different angles (known as angles of refraction) because the angle is affected by the speed of the beams. A person viewing into the crystal will see two images ... of everything. The best way to view the double refraction is by placing the crystal on a straight line or printed word (the result will be two lines or two words). There is only one direction that the beams are both the same speed and that is parallel to the C-axis or primary trigonal axis. Rotation of the crystal will reveal the direction in the crystal that is parallel to the C-axis when the line or word becomes whole again. By contrast, the direction perpendicular to the C-axis will have the greatest separation. The extremely high index of refraction of calcite that causes the easily seen double refraction is also responsible for the interference colors (pastel rainbow colors) that are seen in calcites that have small fractures. Fluorescence, phosphorescence, thermoluminescence and triboluminescence are other important properties of calcite. Although not all specimens demonstrate these properties, some do quite well and this is diagnostic in some cases. One notable case of fluorescence occurs at Franklin, New Jersey where the massive calcite is enriched in a small amount of manganese and fluoresces a bright red under UV light. Some Mexican iceland spar can fluoresce a nice purple or blue color and unique specimens will even phosphoresce (continue to glow) after the UV source has been removed. Triboluminescence is supposedly a property that should occur in most specimens, but is not easily demonstrated. It occurs when the specimen is struck or put under pressure; in a dark room the specimen should glow when this happens. The carbon dioxide gas (CO2) is given off as bubbles and the calcium dissolves in the residual water. Any acid, just about, can produce these results, but dilute hydrochloric acid or vinegar are the two recommended acids for this test. Other carbonates such as dolomite or siderite do not react as easily with these acids as does calcite and this leads to differentiating these somewhat similar minerals more readily. Calcite is intricately tied to carbon dioxide in another way. Since many sea organisms such as corals, algae and diatoms make their shells out of calcite, they pull carbon dioxide from the sea water to accomplish this in a near reverse of the reaction above. This is fortuitous for us, as carbon dioxide has been found to be a green house gas and contributes to the so called "green house gas effect". Environmentally then, calcite is very important and may have been quite important to the successful development of our planet in the past. By pulling carbon dioxide out of the sea water, this biological activity allows more of the carbon dioxide in the air to dissolve in the sea water and thus acts as a carbon dioxide filter for he planet. Environmentalists are now actively engaged in determining if this activity can be increase by human intervention to the point of warding off the "green house gas effect". 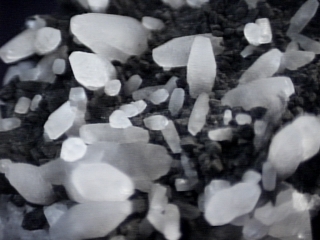 A significant amount of calcite precipitation in sea water is undoubtedly inorganic, but the exact amount that this contributes is not well known. Calcite and other carbonate minerals are very important minerals in the ocean ecosystems of the world. Calcite is not the only calcium carbonate mineral. There are no less than three minerals or phases of CaCO3. Aragonite and vaterite are polymorphs (latin for "many shapes") with calcite, meaning they all have the same chemistry, but different crystal structures and symmetries. Aragonite is orthorhombic, vaterite is hexagonal and calcite is trigonal. Aragonite is a common mineral, but is vastly out distanced by calcite which is the more stable mineral at most temperatures and pressures and in most environments. 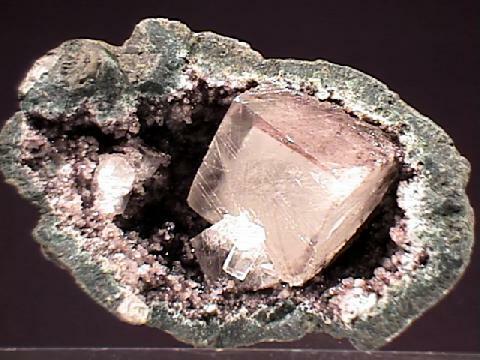 Vaterite on the other hand is extremely scarce and rarely seen. Aragonite will over time convert to calcite and calcite pseudomorphs after aragonite are not uncommon. Calcite is truly one of the best collection type minerals. There are lots of interesting forms and varieties as well as colorful and beautiful specimens to collect. It is generally easy to identify using its rhomohedral cleavage, reaction to acid and double refraction and makes for a great classroom example of these properties. If it is not the significant mineral on a specimen, it might be an accessory to other wonderful minerals and only enhancing their attractiveness. With its many different forms, environments, associations and colors, a collector could never have all possible combinations of calcite covered. Crystal Habits are extremely variable with almost any trigonal form possible. Common among calcite crystals are the scalenohedron, rhombohedron, hexagonal prism, and pinacoid. Combinations of these and over three hundred other forms can make a multitude of crystal shapes, but always trigonal or pseudo-hexagonal. Twinning is often seen and results in crystals with blocky chevrons, right angled prisms, heart shapes or dipyramidal shapes. A notch in the middle of a doubly terminated scalenohedron is a sure sign of a twinned crystal. lamellar twinning also seen resulting in striated cleavage surfaces. Pseudomorphs after many minerals are known, but easily identified as calcite. Also massive, fibrous, concretionary, stalactitic, nodular, oolitic, stellate, dendritic, granular, layered, etc. etc.